Princeton NJ -- Visiting lecturer Andrew Moore '79 devoted six years and some of his own funds to making a documentary about the life and death of little-known artist Ray Johnson. So when the film was recognized at last month's Sundance Film Festival with a special jury prize, Moore felt a tremendous sense of satisfaction, if not disbelief. Alumnus and visiting lecturer Andrew Moore said that there was little material available about artist Ray Johnson's life for the film, so he and his colleague conducted research "like two detectives, reassembling a giant jigsaw puzzle." "It was a complete surprise when they announced our names" said Moore, who was in Park City, Utah, to accept the prize. " Suddenly we were up on stage, thanking our friends. It was like a mini-Academy Awards." "How To Draw a Bunny" tells the story of Johnson, an eccentric figure who played a role in the development of pop art and memorably used celebrities in his work before Andy Warhol did. Johnson was well known in the '60s and '70s for his collages, mail art and performances, but at the time of his death in 1995, had nearly vanished from the art world. Moore was in Detroit working on a documentary when an acquaintance mentioned that Johnson's body had been pulled from the water in Sag Harbor, Long Island. Moore, surprised that he had never heard of Johnson, began researching Johnson's life with colleague John Walter. The two decided that his fascinating artwork and dramatic death -- though it seemed like a suicide, friends at the time speculated it might have been a performance piece gone wrong -- would make an intriguing film. Moore has been making films and working as a photographer since he graduated from Princeton in 1979. He has shot photos for Vogue, Newsweek and Esquire, made videos for MTV, David Byrne and Mabou Mines, and taught photography at the School of Visual Arts and the State University of New York. He has had six solo shows of his photographs in New York City, and has a book of photographs of Cuba coming out this fall. He returned to Princeton last year, and has been teaching "Introductory Photography" and "Computer Graphics" as well as a new course on "Digital Photography" in the Program in Visual Arts. "How to Draw a Bunny" is Moore's first full-length film. 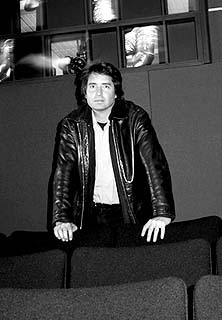 Walter, his collaborator, served as the editor and director while Moore acted as producer and cinematographer. The movie's title refers to Johnson's frequent use of bunny heads in his art, which were a form of self-portrait. They also played off the way commercial art schools once marketed themselves ("If you can draw this rabbit, you too can be an artist!"). There was little material available about Johnson's life, so Moore and Walter undertook the research "like two detectives, reassembling a giant jigsaw puzzle," Moore said. "That was probably the part I enjoyed the most." As the police chief says in the film: "Everybody had a story about Ray, but nobody knew the whole Ray Johnson." The film, which opens with Johnson's mysterious death, is structured like a "pop art mystery story," Moore said. Among the prominent artists interviewed in the film are Christo, Roy Lichtenstein, James Rosenquist and Chuck Close. The film also features an original score by jazz legend Max Roach. The filmmakers spent five years on the project, devoting much of that time to piecing together small contributions from art collectors who admired Johnson's work. Moore also contributed some money from sales of his photographs. The total cost of the film was $200,000. "How To Draw a Bunny" was one of 16 documentaries accepted for screening at Sundance out of the 440 that were submitted. The buzz from the film's award will likely help the filmmakers find a distributor to do a theatrical release of the film. "If that happens, Ray Johnson may finally become a celebrity himself, something he never aspired to while he was alive," Moore said. "His entire life was a game revolving around notions of identity and self-portraiture. In particular he did a very complicated dance with celebrity. He was obsessed with it, and equally obsessed, up until the very end, with subverting his own fame."